A persistent surface trough and onshore flow brought moderate falls to southeastern Queensland and northeastern New South Wales, while troughs and a cold front tracked across southwest Western Australia throughout the week, producing moderate falls in the southwest and southern coasts of the State. Past seven days: At the start of the week, a low to middle level cloundband over Victoria and southeastern New South Wales, associated with the passage of a cold front and pre-frontal trough, produced light to moderate falls across Victoria and southeastern New South Wales. A complex surface trough extending around the continent from southwest Western Australia to New South Wales combined with a moist, unsettled air mass and generated large areas of convection with thunderstorms over Central Australia, southern and southeastern Queensland, and much of eastern New South Wales. 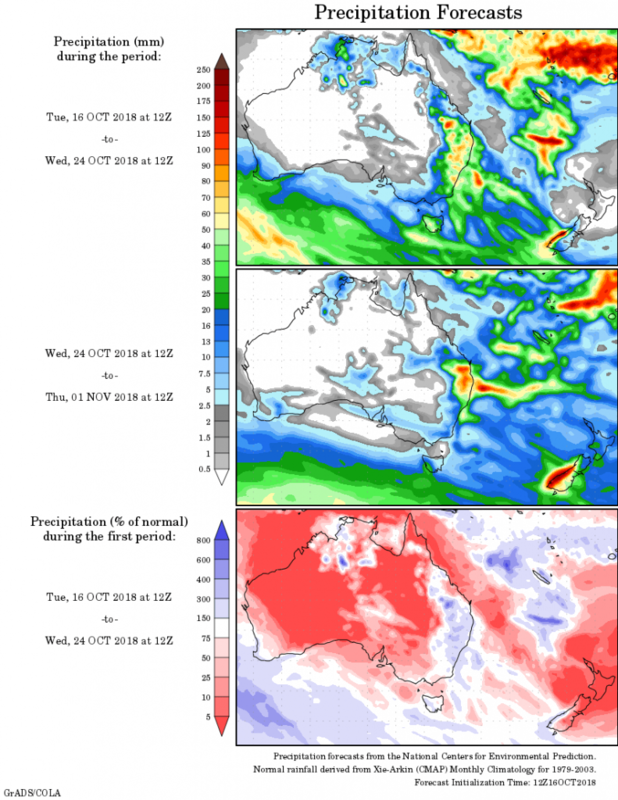 By the middle of the week, showers and storms associated with the trough extended around the Gulf Country and southern parts of the Northern Territory. The surface trough interacted with an upper level trough over eastern Queensland and triggered widespread showers, thunderstorms and areas of rain. Moderate falls were reported in northeastern New South Wales, and much of eastern Queensland. Locally heavy falls were reported in the Wide Bay and Burnett District, and parts of southeast Queensland. The severe thunderstorms that developed in the Wide Bay and Burnett produced very large hail, damaging winds along with two separate tornadoes: one at Tansey and the other at Coolabunia. In the last part of the week, the surface trough shifted offshore but continued to produce showers and moderate falls across much of eastern Queensland and coastal New South Wales. Showers were enhanced about the southern Queensland coast, due to deepening low pressure near the coast, with moderate to locally heavier falls recorded in areas of the southeast Queensland and northeastern New South Wales coasts. From the middle of the week, a trough near the west coast produced light to moderate falls in the southwest Gascoyne in Western Australia, while a low pressure system and cold front tracked across southern parts of the State in its wake, with moderate falls across the South West Land Division and Goldfields District in Western Australia. Extensive thunderstorm activity developed to the east of the system and brought moderate falls to the southeast of Western Australia and southwest South Australia, with lighter falls recorded in southeastern South Australia and western Victoria as the system traversed eastwards at the end of the week. Rainfall totals exceeding 100 mm were recorded in southeastern Queensland and northeastern New South Wales, with falls in excess of 200 mm recorded in parts of the Sunshine Coast, the Gold Coast Hinterland, and the Mid North Coast and Northern Rivers in New South Wales. The highest weekly total was 378 mm at Tewantin in southeast Queensland. Rainfall totals exceeding 50 mm were recorded in areas of northern, central and southeastern Queensland; also about the northeast, central and southeast coast of New South Wales. Rainfall totals between 10 mm and 50 mm were recorded in southern Western Australia; southern South Australia; southern and central parts of the Northern Territory, extending into the southeastern Kimberley in Western Australia and northwestern South Australia, as well as isolated areas around Darwin; about the Gulf Country; isolated areas of far western Queensland; most of eastern Queensland and New South Wales; eastern, central and western Victoria away from the south coast, and in a small area of northeastern Tasmania. Little or no rainfall was recorded in the central interior and most of northern Western Australia; most of the Top End in the Northern Territory; northeastern South Australia; northwestern Tasmania; northwestern New South Wales and far southwest Queensland.